I made these "One Smart Cookie" cookies to send to my son and his family as a double celebration: He's now officially a CPA and he was recently promoted to a new position as Assistant Controller! Along with the promotion came a move to the east for him and his family. We will definitely miss them living in the west, but look forward to new adventures when we visit them in the Baltimore area. CONGRATS, Jesse!!! The design idea is directly inspired by two of my cookie pals, Sugarbelle and Make, Bake, Celebrate. Thanks, gals! I sure love these little faces! These are easy cookies to make. The only difficulties I had was with the royal icing transfer glasses. I had a hard time with breakage when removing them from the wax paper because I hadn't made the royal icing thick enough. 1. Roll out cookie dough and cut out cookies from dough with a round cutter (I used 2.5-inch). 2. Bake cookies according to recipe. Let cool. 3. Outline and fill cookies with the light brown royal icing (I used AmeriColor chocolate brown tinted with a few drops of ivory) and a #3 tip. 4. While the icing is wet, use brown (I used Wilton) royal icing and a #2 tip to add the "chocolate chip" dots (the dots should be the same consistency as the base icing), the "wet on wet" technique. 5. Carefully (while icing is still wet) add the glasses to the cookie. Let cookie dry overnight. 6. Add a smile with some black royal icing and a #2 tip. Congratulations on your son's promotion, Sue! These cookies are so lovely! Congrats for your son promotion! Great to hear about this! Congrats to your son! The cookies look absolutely adorable. CONGRATS to your smart cookie son! Lisa, Your comments always make me smile...Thanks! Congrats!! That is awesome for you son! I love these cookies. They are adorable like YOU! 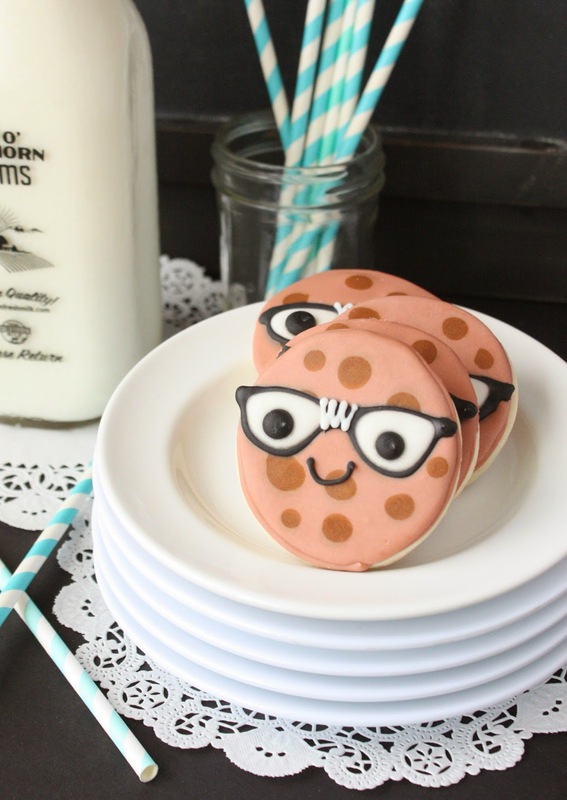 These are so cute and geeky - LOVE! Great news for your son and his family, and more vacas for you too, yay. Congratulations to your son on achieving his CPA certification and on the new promotion. Very well done. 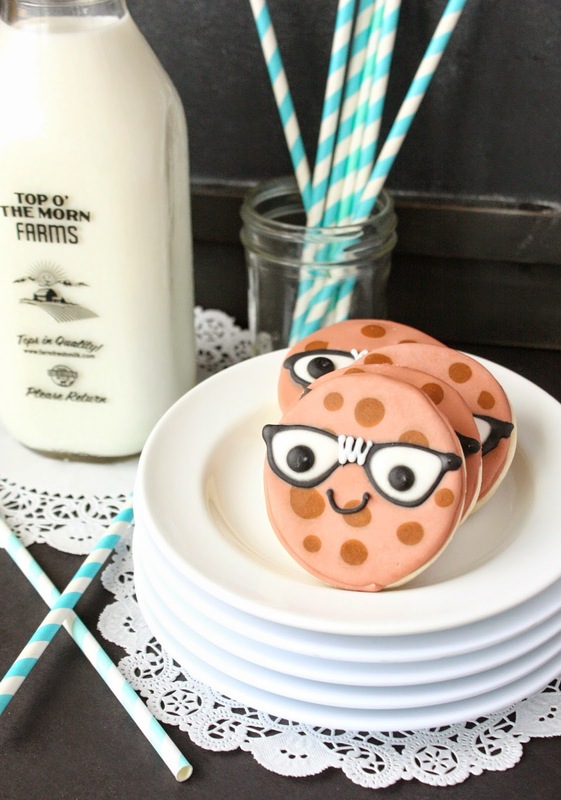 Such a sweet celebration cookie too! Very cute. Dare your childs eat them?